Quentin is a teacher at Northern New Mexico Community College in El Rito, NM. Follow the links he provides to learn of recent adobe construction from here in New Mexico to Mongolian yurts. Quentin Wilson's Q&A page, with helpful information about adobe building. Adobe is Not Software was founded by architect Ben Loescher in 2009 to "inform, enable and advance adobe construction in California"
David C. Peterson Construction presents a photo tour detailing the construction of a custom adobe house, from clearing land all the way to installing appliances. A non-profit organisation representing the manufacturers and builders of earthen homes, including adobe and pressed block. The Adobe Builder Magazine is produced by Joseph Tibbets, Director of The Southwest Solar Adobe School.The amount of profound information will exhilarate you. 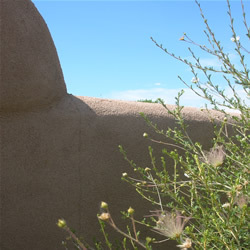 Non-profit Adobe restoration and preservation, preserving historic buildings in the Southwest and Mexico. A Yahoo chat group for adobe home owners and builders. Kurt Gardella now teaches classes through Adobe in Action. The Southwest Solar Adobe School offers regular classes on building with adobe, including walls, houses, and current codes. Kurt Gardella offers online courses in Adobe Construction and Renewable Energy. A popular fireplace style for adobe homes! For over 50 years, leaders in Southwestern Materials. Groff Lumber stocks a variety of rough hewn lumber and timbers; including corbels, vigas and latillas. Providers of wooden building materials, from the traditional vigas to custom designs. A couple of like minded Realtors in New Mexico, to help you find the right piece of land for your adobe project. An established photograper specializing in real estate with an emphasis on virtual tours. The Adobe Alliance is a non-profit group dedicated to helping communities apply cooperative building techniques in earth architecture and to educating groups in fulfilling the widespread need for low cost, salubrious, energy efficient, sustainable housing. The Mid-Region Council of Governments supports local food and local farms. Fantastic resources. Have a question on gardening in NM? Find the answers here!